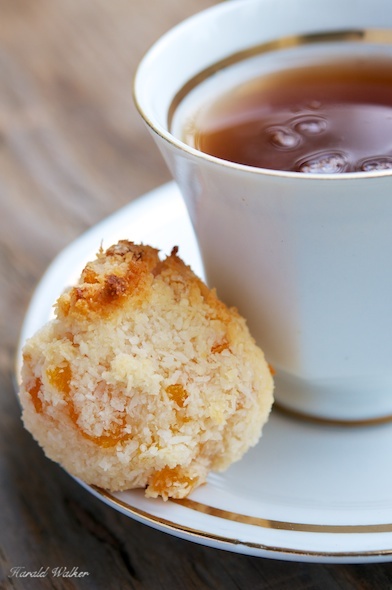 In celebration of our first post 6 years ago today, we remade and adapted these tasty apricot coconut cookies. Cut the dried apricots into small pieces. Place the apricots in a bowl and pour 1/4 cup apricot brandy over them to allow them to soak and plump up (about 10-30 minutes). Place the 2 & 1/2 cups of coconut flakes in a bowl. In a small bowl beat the egg replacements to a light fluffy mixture. It won’t be a light and fluffy as eggs, but somewhat. Pre-heat the oven to 325 F / 163 C.
Add the sugar and beat some more, add the agave and salt and beat again. 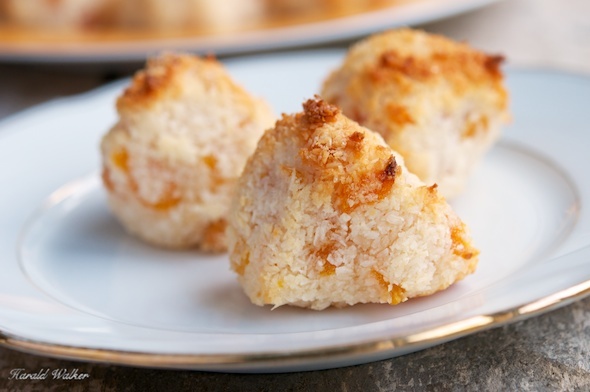 Add the plumped apricot pieces to the coconut and mix well. Add the sugar and egg mixture and again mix well. You should be able to press the mixture together and have it hold together, although still rather crumbly. If it is too dry, you could add some more brandy or apple juice. Take one generous tablespoon of the mixture and by hand compress the mixture to form a ball or rounded pyramid. Don’t make the cookies too large, as they are quite delicate when cooked and could fall apart. Place the cookies on a parchment prepared baking sheet. Proceed to make about 16 cookies. Allow to cool and carefully remove from the cookie sheet. Posted by Chris Walker on November 16, 2012 in Apricot, Coconut, Desserts and Sweets.